Then I Got To Thinking...: Vegas!! Now that looks like a blast- awesome little blune number you've got there hun! you look stunning! love that blue dress on you. now i want to go back to vegas! Tracy-Girl, you have a figure to die for, I don't think I have EVER looked like that - you are beautiful!!! They are great pictures! Looks like you had a party that you'll remember for ever! OMG looks like so much fun! I wish I could have been there! Looks like you had a blast!! And man you wore some HOT dresses! Totally jealous of your tiny little figure! Great pictures and I love the blue dress! Love that blue dress! Looks like such a fun time! It looks like you guys had a blast. You looked gorgeous! Hi love, I have missed you on our blog world, glad to see you had a BLAST and you look just beautiful in your blue dress and your white dress is so pretty! Hey, I want to send you a giftie for your upcoming wedding, would you feel comfortable e-mailing me your addy? My e-mail is oceandreams4sierra@gmail.com - Thanks love and hope you are enjoying your week! You look so pretty in all your pics! Looks like your girlfriends did a great job throwing you a wonderful party! Looks like you had a ton of fun! I love Vegas! And you all look positively adorable. Hm...could you be ANY prettier? You & your girls look great - love the little blue dress! Looks like you had a lot of fun. I am so jealous! OMG! Pictures are worth thousands of words and YOURS include every word connected to BEAUTIFUL, JOY, LOVE, FRIENDSHIP, FUN, AND HAPPINESS !!! was your veil a clip or the like comb type? I'm planned a bachelorette party for next weekend and I can't decide how I want to make the veil! Help! I'll consult Kelly too! Wow you have some figure girl!! And that blue suits you to perfection! That looks like such a dream getaway with friends! Glad you had an amazing time! FUN!!!! 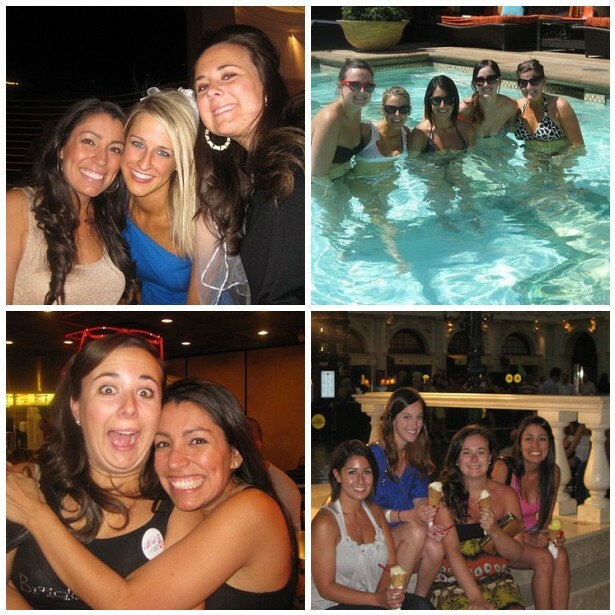 it looks like you had SUCH an amazing girl's vegas weekend!!! 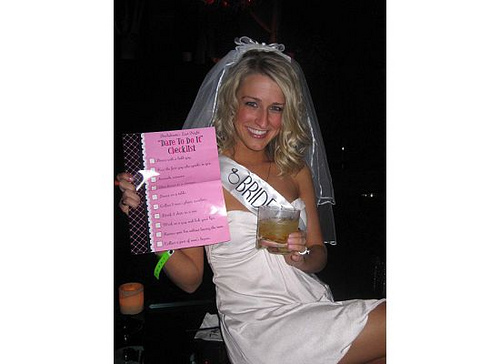 and you looked beautiful the entire time...my girlfriend is having her bachelorette party weekend down in destin, fl the first weekend of october and these photos just got me SO excited!! OH Yes. Memories of being young!! hehe Looks like you had a fabulous time!! Good for you! Beautiful pictures!! Looks like you guys had an awesome time! I bet it was crazy! Agh! So fun! You are such a doll! That blue dress is stunning on you btw!! :) Glad you had fun, lady!! :) XOXO! So fun, darling! That asymmetric dress is fantastic, as are these pics! tagged you on my blog for something fun!! Looks like you guys had a BLAST!!! Omgosh, I absolutely LOVE what you're wearing - and in that first picture you totally look like Blake Lively =) Seriously, it looks like so much fun! Congrats again...so exciting that the big day is coming up so soon! Wow, looks like you had an amazing time! You are stunning in the blue dress! I can't WAIT to see wedding pictures! Wow, you are super adorable! You must love your friends! WOW!! looks like you ladies had SUCH A BLAST! holy moly that dress looks AMAZING on you!! WOW! GREAT COLOR! i just got back from vegas and it was fabulous. what great friends you have! Looks like you guys had a lot of fun! I just noticed, you look like blake lively in some of the pics...and that's a good thing because i think blake is uber-hot!